Wired Women profiles successful women with ties to Boston who are pursuing their passions. These women serve as an inspiration not only to myself, but to women and girls everywhere who are eager to make waves in their field. These fab women will be sharing their stories twice a month while sharing their experiences. This week I'm profiling my amazing friend Cindy Gould! Cindy and I met back when we worked at Barnes & Noble Cafe during her days at Berklee College of Music. 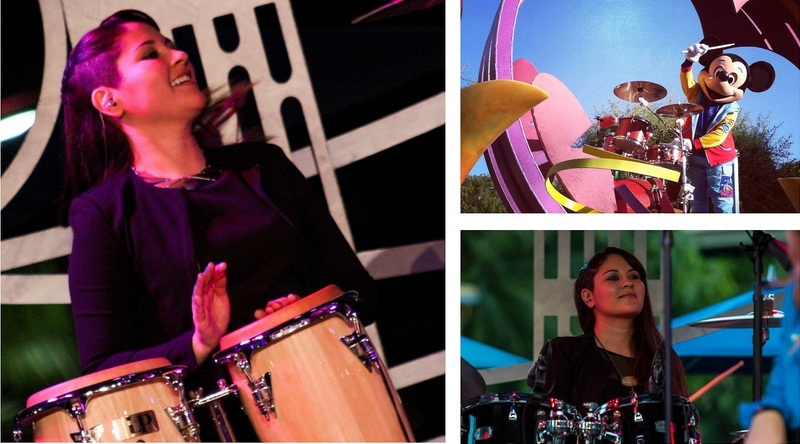 After graduating she returned to sunny California where she has excelled in her career as a drummer at Disneyland. Style-Wire: You were born and raised in California and went right back after college, why not stay in Boston? Cindy Gould: I will forever be a California girl. There’s no way I could permanently live somewhere else! Though I did love living in Boston, the music scene is thriving in Los Angeles and it’s much easier to network and pursue my career out here. It’s been great running into old friends from Berklee who also decided to make the move! SW: What did your parents say when you dropped the bomb that you wanted to go to music school and be a professional drummer? CG: Lucky for me, there was no bomb to be dropped! I’m a 7th generation musician so it was pretty obvious I would pursue a career in music. They’ve been so supportive of my drumming, I would not be where I am today without them! SW: I can't name many female drummers; how has being a female musician affected your career? CG: It’s been a blessing and a curse. There have been situations where being a female drummer has worked in my favor and there have been plenty of times where I was immediately rejected because I wasn’t “as aggressive as a man would be". It’s been a tough road for sure but it’s really inspired me to work harder! SW: How did you end up auditioning at Disney? CG: A good friend of mine from high school called me during my last few weeks in Boston to tell me about an upcoming audition for drummers under 5’2’’ at Disneyland. I’ve been a huge Disneyland fanatic since I was 15 so I knew I had to try out! I flew out for one day to audition then flew right back. I couldn’t even make the callbacks! They ended up liking me enough to hire me without a second audition and I started working before I was even done with college. I never would have guessed that one audition would be such a huge career move for me! CG: The fun thing about being a musician at Disneyland is that you are given the opportunity to audition for any group in the park. I was primarily hired for the parade but in the last four years I’ve increased the number of groups I play in from one to six! Each group has its own routine so every day is different. There are days when I play in Fantasyland the whole time and there are days when I get to be the star of the parade on Main Street! I love that there really is no typical day at Disneyland! SW: You live, eat, sleep, and breathe Disney, do you see yourself working for Disney for the long haul? What's next for you? CG: I can’t see myself working at the park forever but I can definitely see it happening for a long time. Disney has been a great “day job”. So many musicians struggle to pay their bills while attempting to find musical work and many have to get a day job to support themselves while they look. I’m extremely lucky to have a day job that is furthering my musical abilities and paying my bills at the same time! I wish I could say this happened right away but I had to work hard to get here. I still look for outside gigs and pursue as many playing opportunities as I can, but for now I am so thankful to have this job! SW: What's your favorite Boston memory? CG: Oh man…there are so many to choose from! I would have to say my favorite memory would have to be my first job in Boston. I worked in a bookstore cafe and though it wasn’t a glamorous job, I really enjoyed what I did! I learned a lot about responsibility (I was 19 years old and living away from home for the first time) and I made some great friends who I still talk to often!